The cultivation of wine can be traced back to antiquity. In particular, the skilled efforts of the Romans greatly influenced the viticulture development along their occupied territories including France. In Burgundy, it was the monks of Citeaux (called Cistercian; Cistercium the Latin name for the village of Cîteaux) who were responsible for elevating the Roman process of cultivating vines into an art form. These monks strictly followed the Rule of St Benedict (St Benedict of Nursia: c. 480 – 547) a book of precepts regarding the monastic life which also included the encouragement of manual labor and self-sufficiency. Thus the abbeys founded in Burgundy supported themselves through a variety of activities including viticulture. Gradually, the monks advanced their knowledge base by dedicating themselves to academic pursuits not only in agriculture but in research, science and medicine. A celebrated and frequently visited vineyard along the wine route is the Clos de Vougeot (clos = walled-enclosed vineyard). Located in a beautiful setting its vines are a lasting example of the Cistercians’ work. Traditionally, the Benedictine monks of Cluny had already introduced to the region the subsequent grape varieties: Pinot Noir (for reds) and Chardonnay (for whites). However, these industrious viticulture experts discovered that there was a pronounced difference on the quality and tastes of the wine depending where the plant was sown, sometimes 200 meters could make a real difference. As such, they parceled the Clos de Vougeot vineyards accordingly. Of course, the geological variation of the soil is important. However, the orientation/exposure to the sun, rains, local climate alterations, slope, drainage, etc., are equally significant to the outcome of wine vintages. Hence, the concept of Terroir/soils in Burgundy is the main factor of designating a wine’s originality. Today, Clos de Vougeot is owned by an array of independent wine growers and the chateau is owned by the Société civile des Amis du Château du Clos de Vougeot (“Friends of the Château du Clos de Vougeot”), which leases its facilities to the Confrérie des Chevaliers du Tastevin. The Grand Cru appellation is bestowed upon this elegant wine which was honored by Isak Dinesen in her literary work “Babette’s Feast” due to its remarkably intense bouquet. The wine road and villages between Dijon – Beaune may be visited by car, rental bicycles tours or by promenading its gentle hills. Each road sign along the way is a recollection of a fine wine list waiting to be revealed and tasted. For this reason, visitors are welcome to stop along the string of villages for wine tasting and purchases. Arriving in Beaune, which is considered the capital of burgundy’s wine, there are further opportunities for wine tastings in restaurants, commercial venues as well as wine-related institutes offering formal (certification) and informal classes. A historical landmark worth visiting in Beaune is the Hospices de Beaune or Hôtel-Dieu de Beaune. The Hospices were founded as a charitable hospital in 1443 by Nicolas Rolin, chancellor of Burgundy, and his wife. Its architecture represents the 15th century style well. Of particular significance, since 1851 every year around November, the Hospices hold a classical and influential charitable wine-auction devoted to the food and wines of Burgundy. It is a worthwhile social and cultural experience! After an eventful exploration of the region, I highly recommend visiting the picturesque village of Meursault. 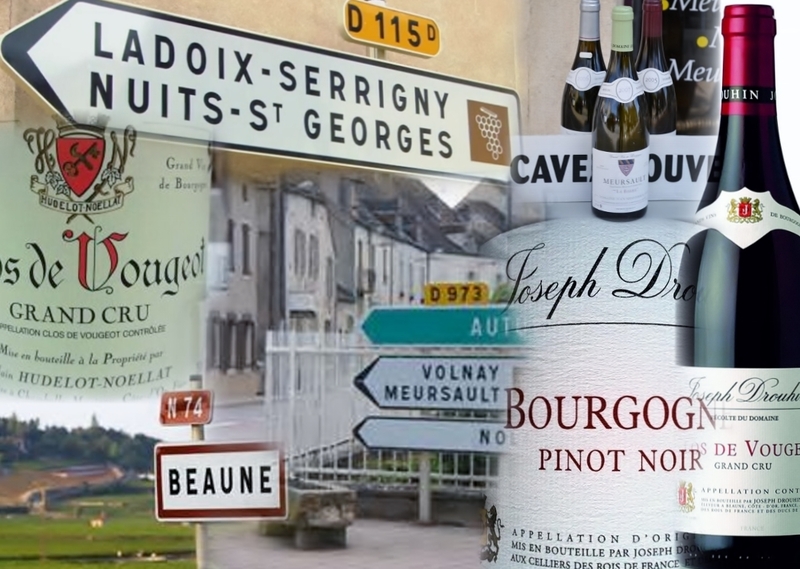 Located on the Côte of Beaune, these fine white wines vineyards are exclusively cultivated from Chardonnay grapes. While exploring the village, stop by the office of tourism and they will help you rent bikes and even secure a place on a hot air balloon ride of the region. This is a beautiful area and I highly recommend staying at La Cueillette Hotel & Spa. This lovely 19th century château was built on the foundations of a 12th century Cistercian residence within walled vineyard parcels allowing for pleasant promenades through nature. At the Spa you can reward yourself by plunging into the whirlpool and swimming pool. For a total body relaxation, I recommend their sauna followed by their “Frutithérapie” exfoliating massage with red berries pulp, honey and grape seed oil. Certainly, all of their well-being beauty products make great souvenirs to take home. The Château de Cîteaux also provides fine dining with an exquisite ambiance. If you cannot stay long at La Cueillette, I recommend at least paying a visit to their Sunday brunch which is a memorable banquet that you can share with friends and family during the warm summer months. Their ample veranda is a most favorable place for such fetching celebration and for building lasting memories. Tags: Babette’s Feast, Beaune, Benedictines, Bicycles tours, Burgundy, Burgundy Vineyards, burgundy wines, Côte de Nuits, Château de Cîteaux, Cistercians, Clos de Vougeot, Cote d'Or, Dijon, Empire, France, Gastronomie, Hospices de Beaune or Hôtel-Dieu de Beaune, Isak Dinesen, La Cueillette Hotel & Spa, literature, Meursault, Oenology, Restaurants, Romans, Spa, Travel & Leisure, Travel & Spas, Travel and Tourism, Vineyards, viticulture, Wine Route Tours, Wine Tourism | Permalink. Quotidian life in Dijon takes a visitor or an unfamiliar expatriate resident into a journey where there is a visible transformation of expectations and priorities. Certain habits like a hurried lifestyle perhaps compulsory in greater metropolises are not fitting here. Usually, each working day dedicates two hours for lunch to discuss varied topics with friends or colleagues at a favorite restaurant. For the disciplined souls, this time may be used to read a favorite book or even write an animated short story. Ultimately for the romantics: sitting at a local “café” or “salon de thé” is a time for practicing the sacred art of reflection as life unfolds before you. Certainly “running errands” during lunch is not a worthwhile pursuit since the post office, the bank or any other significant places will also be closed as their employees “in solidarity” will go to lunch at the same time everyday usually from 12h to 14h. However, one can easily get accustomed to this new life style especially since some may even leave work early especially on Wednesday to enjoy the varied coffee shops in the city. Dijon has an enjoyable collection of coffee shops and tearooms. Even the newly remodeled Art Museum has a good coffee shop waiting to warm any patron after a gratifying tour of its elaborate halls. Native dijonnais usually become attached to particular venues because these places transform themselves into a “parlor” where individuals come together with the most valuable persons in their lives. Nonetheless, I have embraced the habit of trying different places because it pleases me to discover new settings. Some of my favorites ones are: the “Comptoir (trading post) de Colonies” at 12 place Francois Rude. This is a very popular venue with the native residents. The Comptoir has a flavorful collection of teas and coffees from about 15 different places around the world. My favorite flavors are: the Brazil/Santos a full body, aroma rich and yet less acidic type of coffee and the bold flavor of the Colombian Supreme coffee. The hot chocolates with cream on top are also a fare to behold and taste. Almost in front of the Comptoir is the celebrated statue and fountain “Bareuzai,” representing the personage of a wine grower treading on local grapes. Also, next to the fountain is the iconic merry-go-round/carrousel that since the 1900s to this day delights young children’s disposition. Following the streets of Dijon toward place Grangier and the main Post Office is the “expresso-T” a coffee shop at 21 rue de la Poste. Within their cozy ambiance, they make a delicious cappuccino plus they also offer other complementary treats like bagels, muffins, salads, crepes etc. Yet, for a true “Salon de Thé” experience, “La Rose de Vergy” at 1 rue de la Chouette behind Notre Dame cathedral is one of my favorite places. Their convivial setting has a marvelous and varied assortment of teas, biscuits, and other gourmet treats. I love going there at the end of a very busy day and drinking their Assam tea while looking outside to some of the oldest streets in Dijon, rue de la Chouette and rue Verrerie. There are other interesting places along rue Musette. A well-favored place in this street is the fine Italian market “La Dolce Vita.” Here, all sorts of fantastic gourmet goods from Italy are available for purchase. In addition, they have a wonderful restaurant above the market where the recipes are true Italian creations. In the afternoon, La Dolce Vita becomes an ideal place for a coffee break because not only do they have fragrant Italian coffee that goes rather well with a hot slice of “Panettone (A traditional sweet bread loaf with dried fruits originally from Milan. An Italian delicacy especially during Christmas and New Year)” but also an incredibly tasting Italian hot chocolate which is a ray of sunshine especially during the severe winter months. Another possible stop on this street is “Tartin’Art.” Inside, an imaginative consumer can choose multiple toppings to decorate a toast/tartine: from salmon to fresh mozzarella on a bed of tomatoes or lettuce or avocados. Of course, such treat should always be accompanied by a hot cup of java. After teatime, a visitor may choose to ride a bike through the streets of Dijon. Bikes are easily accessible for rental throughout the city and bike lanes are available along the Tram trajectory such as riding and resting by the beautiful fountain at place de la Republic. Later, it is also a treat to stop and catch one of the latest movies at the theater at place Darcy. All movies are dubbed in French like most places in France and it is a good way to practice French comprehension skills. Another theater close to the University, the Eldorado, may show from time to time movies in their original language. One may decide instead to explore the city by strolling leisurely through its center. From place Darcy you can walk through the portal/door “La Porte Guillaume” an official monument edified in 1786 honoring the prince of Condé. It signals the entrance into the center of the city and the rue/street de la Liberté. The famous Galeries Lafayette always displaying the latest fashions and home furnishings. There are also elegant shops toward the end of rue Piron and inside the Passage Darcy. In addition, trendy shops can be found around place Grangier such as the Italian shoe store Brunate, Hugo Boss and a variety of kitchenware stores. Many hair salons grace this area yet, my favorite is “Carlo Bay” on 6 place Bousset. The staff and owner are professionals who provide an array of excellent services leaving you completely gratified after each visit. Should you need a new computer, a TV, but also books or any other electronic gadget FNAC on rue de Bourg is a wonderland offering great seasonal sales. Fine chocolates, one of the French most beloved traditions, can be found in elegant settings such as Fabrice Gillotte, “créateur chocolatier,” on rue de Bourg in front of FNAC. Another well-known chocolatier is Carbilet close to Place François Rude. As always, while walking on the streets of Dijon you will often hear different styles of music and street performances, so be ready to leave a few coins behind in gratitude. A couple of years ago I visited the shopping center “La Toison d’Or,” located in the northern region of Dijon: I was not impress. Now, my opinion has changed. Recently, the place has been completely remodeled and new additions were incorporated. The grand opening was at the end of October of 2013 with great attendance and a fine piano player to inspire shoppers. The transformation was comprehensive and astonishing. The new mall or “centre commercial” is modern with stylish shops from the Apple Store to Desigual and a thriving food court and restaurants. It is a straightforward drive from the city center or one can simply board Tram #2 and exit at the Toison d’Or exit. Tags: Bareuzai, bicycles, bike rental, Burgundy, Coffee shops, Coffees, Comptoir de Colonies, Cote d'Or, Dijon, Express T, Italy, Kitcheware, La Dolce Vita, La Porte Guillaume, La rose de Vergy, Milan, Panettone, place Darcy, place de la Republic, place françois Rude, place Grangier, rue de la Chouette, rue de la Liberté, rue Piron, Salon de Thé, Shopping, streets, Tartin'Art, Teas, Toison d'Or, Tram, Travel and Tourism | Permalink.